Used Condition, Budget Price, Unrepaired - Surface rust and dents, Wind and water tight, Vermin Proof, Structurally Sound, Lockable. 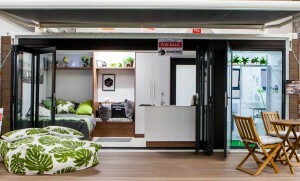 Basic 2 bedroom converted 12M shipping container with standard fittings. Conversion includes NS4 coating, laminate flooring, interior ceiling & walling, plumbing, electrical fuse board with sockets & energy efficient light fittings, aluminium windows, aluminium external door, wooden internal door and frames, lock sets, fitted kitchen, fitted bathroom with splash tiles around shower. Standard transportation fittings. Basic 4 bedroom converted 6M shipping container with standard fittings. Conversion includes NS4 coating, rubber flooring, interior ceiling & walling, plumbing, electrical fuse board with sockets & energy efficient light fittings, aluminuim windows, aluminium external door, wooden internal door and frames, lock sets, fitted bathroom with splash tiles around shower. 2 singl bunk beds with privacy curtin and draw space. Standard transportation fittings. Basic converted 6M shipping container with standard fittings. Conversion includes bunk beds, laminate flooring, NS4 coating, interior ceiling & walling, electrical fuse board with sockets & energy efficient light fittings, aluminium window, aluminium sliding glass door, cupboard space. Basic converted 6M shipping container with standard fittings. Conversion includes NS4 coating, hygiene flooring, interior ceiling, plumbing, electrical fuse board with sockets & energy efficient light fittings, aluminium windows, aluminium external door, polycarboflex security glass alternative, lock sets, Standard transportation fittings. Basic converted 6M shipping container with standard fittings. Conversion includes NS4 coating, hygiene flooring, interior ceiling, plumbing, electrical fuse board with sockets & energy efficient light fittings, aluminium windows, aluminium external door, polycarboflex security glass alternative, wooden internal door and frames, lock sets, Standard transportation fittings. The costs for each render is R4,500 ex VAT. 50% is required upfront and will take a week to return to you. A maximum of two changes are allowed per render. Please send us the deposit and attached your proof of payment. We'll get working on your request straight away!